Can you believe it’s the last week of August already? Where has the summer gone? I know mine had just flown by! Last week I was busy in my kitchen preparing all sorts of goodies to kick off my monthly spice giveaway and link party: Party Thyme. If you’ve never entered, now is a great time! This month, not only will 5 people win a set of September’s featured spices but 5 people will win all 12 of the summer’s featured spices. To enter to win a set of these spices go HERE. Well, it’s Wednesday which means it’s time for the weekly link party I co-host with these lovely ladies! If you’d like, take a moment to add our button (on my side bar) to your blog somewhere – the more the merrier! Or, follow our hosts so you don’t miss out on all the great features each week! Here are a few projects that caught our eye (and remember, these features are being seen on 4 different blogs)! Aren’t these features amazing? Everyone who was featured, grab a button and strut your stuff! 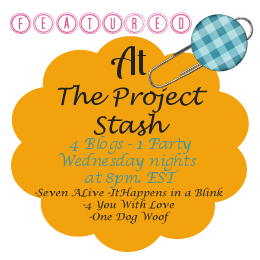 Now I can’t wait to see what you’ve been up to this week and how you’ve used your stash! « Party Thyme – Preserving the Summer Link Party AND Summer Thyme Spice Giveaway AND Sept Spice Giveaway!